The Hinge sofa bed's minimal design makes it well suited to contemporary and mid-century spaces alike. 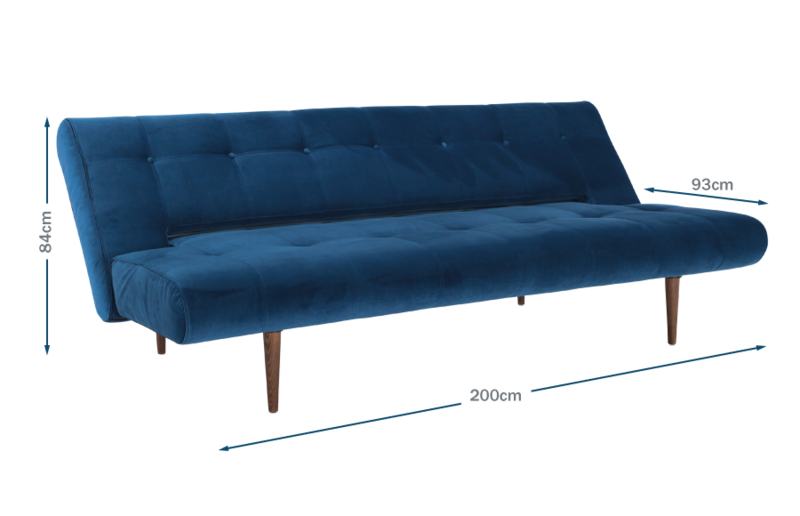 It features deep button cushion detailing and its unique tilting mechanism allows the back of the sofa to be set at two different seating positions or to be laid completely flat. When set up as a sofa, the back rest has a gentle lean offering a comfortable recline that can be styled with colourful scatter cushions for extra support. Simple, classic design perfect for the modern home. The in-house designed ‘click-clack’ mechanism, provides two back rest angles of upright and relaxed as well as flat, making the Hinge perfectly versatile for modern living spaces. Finished in a luxurious royal blue velvet for comfort and style, suited perfectly to contemporary spaces. Deep button cushion detailing creating a textured finish to the smooth velvet. Cushioning features 10cm istyle pocket springs, creating a firm yet comfortable sit that will keep its shape over time. Really like it. Had some trouble getting it to stay in most upright position after making it Ito a bed. More a queen than a double. Looks great. Nice sofa but arrived with nap marks and needed brushing immediately.